A great cardio experience that everyone can enjoy. Spinning at the club is the embodiment of a group workout. We offer spin a variety of times throughout the day in a room solely dedicated to spin classes. Each individual will feel part of a larger group as they travel though the simulated outdoor bike ride. In addition, the spin-specific room is spacious and filled with music from a modern and updated sound system. These high energy classes at the club are taught by instructors with an average of 10 years of experience. Therefore ensuring participants develop and maintain correct technique, while getting the most out of their workout in a safe and fun atmosphere. 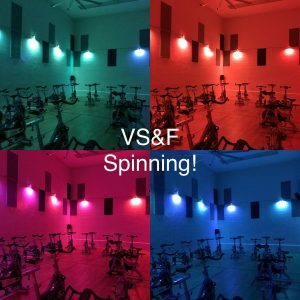 Spinning is one of the clubs longest running and most popular classes. This is truly a class for anyone who wants to add some great cardio into their workout. With the lights low and the music up, the instructor will take you on a ride that simulates an outdoor bike-ride, including a a giant fan 20 feet up to simulate the wind on an outdoor ride. This is a great class if you are a beginner. The instructors are ready to help you to get the most out of your first workout, while still staying within a safe and fun level of effort. However, for more experienced riders, this class offers an opportunity to push your limits and build endurance. 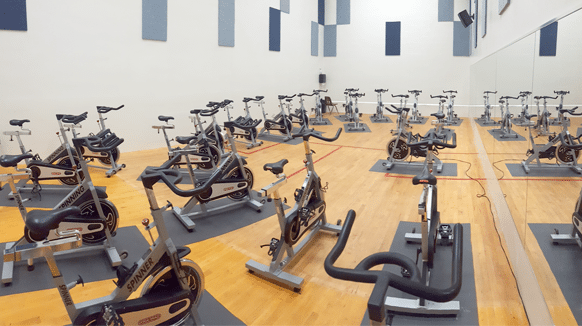 Also, the spinning room is staged with a theater spread of bikes surrounded by mirrors, allowing participants to correct form. The instructors will teach you how to ride in a way that benefits your body from top to bottom, all in a safe and fun atmosphere.